In my opinion, when it comes to lenses, there’s practically no better bang for the buck than Canon’s EF 40mm f/2.8 STM, better known as the “pancake” lens. Are there better lenses? Sure, so what’s so good about this one? Well, for roughly $149 or less you’ll get a quality lens that is extremely small for when you don’t want to lug around the big lens or want to be discreet and blend in. Sure, it’s not a zoom lens but you can go manual zoom and use your two feet for that. If you’re a photography newbie, or on a budget, this is a bargain! Even though I own better lenses, my pancake lens takes up so little space that it’s always tucked away in my bag as another tool in the toolbox. It’s perfect for shooting on the street or in tight spaces, I’ve even shot sunrises to see if it could handle it! The above image is from the Canon website where you can also see the technical specs of this lens. All of the below photos were taken with the Canon EF 40mm f/2.8 STM pancake lens. I always mention that I lived in Italy for many years, the reality is that it’s a big part of me and I miss it. At the time, there was so much to photograph around me that I almost forgot how lucky I was to just be there. While the food lived up to its reputation and the people were amazing, the other experience I loved from day one was the coffee! This photo, Cappuccino?, is the the norm for Italy. Coffee isn’t some fad, novelty, or trend; it’s always been a part of daily life in Italy and taken seriously. Italian bars, very different from American bars, are where Italians meet on the way to and from work, where they socialize, conduct business; you name it and it happens in the bar. Italians serve real coffee, not the S*******s cup of ‘God knows what’s in it’ stuff we get in ‘Merica. There aren’t a bunch of flavors either, just a simple cafe of a few varieties depending on how strong your want it or if you’d like it with milk; then there’s the ever popular cappuccino. Made of simply coffee, milk, sugar, and a little coco on top, the cappuccino isn’t complicated and appears pretty much the same all over Italy! I love the USA, but if any county can complicate something and distort it so far from it’s origins, it’s us. Man, I miss that Italian simplicity… This black and white photo, Cappuccino?, was shot with a Canon 7D, at f/2.8, 1/1600 sec, ISO 100. Can you tell I miss Italy yet? Sometimes, as a traveler, I try to find things that are routine to the locals and often overlooked by those of us visiting. Recently, a photographer mentor of mine gave me the most incredible advice, he said I should constantly ask myself, “what am I not seeing here?” (thanks EM). It sounds simple in concept, but if I actually ask this question to myself I begin spotting things and shoot subjects I would have previously overlooked. 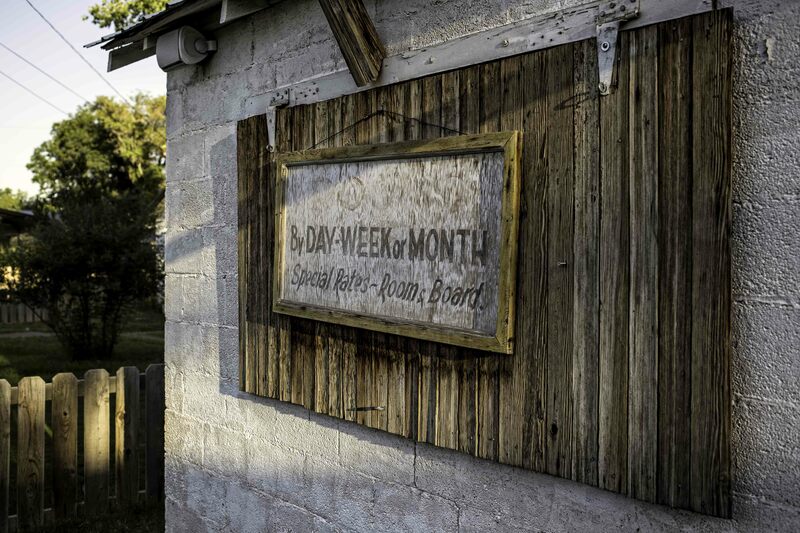 I doubt this old room and board sign hanging on a motel wall in Balmorhea, Texas draws much attention to the folks who live there but it did make for a nice photo and memory for me. I was putting our luggage back in the car and spotted this sign. I call this photo Special Rates, it was shot with a Canon 6D, at f/4.5, 1/250 sec, and ISO 100. The sun had been up for about an hour and was casting some nice shadows. This little pancake lens did a pretty good job grabbing the details in the wood too. This pretty red flower was sitting next to a parking lot in Vietri sul mare, Italy on the Amalfi Coast. I wanted to see if the colors of the flower became washed out but the pancake seems to have done just fine. This photo, The Amalfi, was taken with a Canon 7D, at f/11, 1/80 sec, and ISO 100. There is so much beauty in Italy at every turn of the road that it’s mind boggling. This little pancake lens was very handy when out walking about and really not on a mission to photograph anything in particular. However, once when I was out shooting a Neapolitan sunrise and I thought I’d test my pancake. The photo at the bottom, Red Skies, was shot with a Canon Rebel T3i, at f/9, 30.0 sec, and ISO 100. The pancake lens performed well, even on a 30 second exposure! Brand spankin’ new this lens sells for $149 and I don’t know of a better lens for that price. Sure, it has limitations like any lens and as I mentioned earlier it is not a zoom and it probably wouldn’t fair well for macro work, shooting sports, or action shots. However, for most other situations this lens does a capable job and much better than some other lenses I’ve owned. Lastly, I would offer this, if you’re considering shelling out the bucks for a 50mm prime lens, consider this first to see if shooting without a zoom lens suits you. At $149 you can’t go wrong and might even find this lens a lot of fun as I have!